Mullingar Pewter wedding bells features the Claddagh and it is one of our most popular wedding gifts. 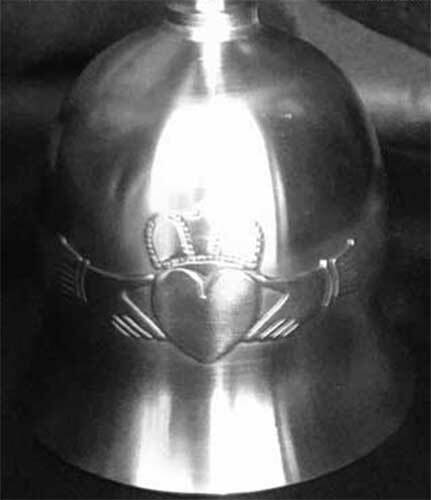 This pewter Claddagh bell is commonly known as an Irish makeup bell. The Irish Gift House includes the following verse with the Mullingar Pewter wedding bell. An old Irish tradition is to give a bell on the occasion of a wedding. A decisive moment is always announced by the ringing of a bell and in Irish culture it is no different. The bell affords good luck and if at any time during the marriage there is discord the ancient Irish remedy for lovers quarrels is to ring this special bell, breaking the spirit of discord, and renewing the spirit of love. The Mullingar Pewter wedding bell is just one of the many Irish bells offered at The Irish Gift House. All our bells feature an Irish icon or two such as the Celtic cross or even a leprechaun and you will find them constructed out of materials such as brass or fine porcelain. Please visit our Irish Bells page in the Irish Gifts for the Home section or the Irish Wedding Bells page in the Irish Wedding Gifts section so that you may see many additional choices.